Pastoralism has often been cited as one of the great industries of the Northern Territory (NT). It has certainly also been an important part of the NT's identity. The period between the mid-1860s to 1895 was a time of large-scale pastoral settlement and development in the NT. Huge runs were taken up, large sums of money invested and hundreds and thousands of sheep, cattle and horses were overlanded to stock the new properties. For Aboriginal people this development was often a story of invasion, dispossession and exploitation. For the pastoralists in the early stages it was often a story of physical and financial hardship, tremendous isolation, poor country, scarce white labour, small local market, lack of infrastructure, stock diseases and uneasy relationships with the Aboriginal people whose land they now occupied. Ironically Aborigines became an important component of the NT pastoral industry until the introduction of equal wages in the late 1960s and the introduction of aerial mustering when numbers rapidly fell. Overall it has largely been a story of constant boom and bust and in the process, changing from the packhorse era to road trains and beef roads, aerial mustering and two-way radio and satellite communications. This listing below shows that government, non-government and to a larger extent personal collections including oral histories are well represented at the NTAS. The records provide a wealth of information to help paint a picture of what life was like for pastoralists and Aboriginal people at the pastoral frontier in the NT. This guide is by no means comprehensive and will be updated periodically as more material is located within NTAS holdings or deposited with NTAS. The series of records listed here may not all be immediately available on open public access. NTAS staff will advise you about access. 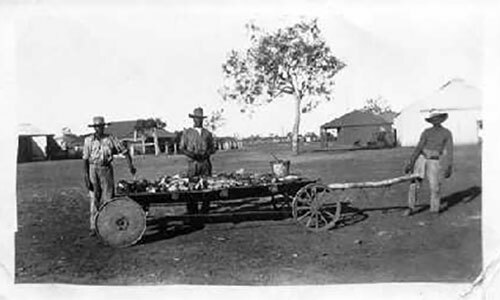 For more information see the NTAS list of holdings or List of Government and Community Records Relating to the Pastoral Industry in the Northern Territory (52.7 kb) - oral histories are not included in this list. Contact the NTAS for more information. The records series within this category are listed under the title of the NT Government or local government organisation which created the records. Sometimes where the records spanned the control of several organisations, the series will be listed under the title of the transferring organisation. In such cases a list of predecessor organisations is included. Series entries include the control number (NTRS or F), the series title and the date range of the series. 1931 : Office of the Administrator N.T. Series notes: These files dealt with issue of pastoral leases over Crown Lands. Series notes: These files deal with licences issued to persons to graze stock or any particular kind of stock, on any Crown Lands, which are not held under lease or licence, or on any reserved or dedicated lands, for such period, not exceeding one year. Series notes: These leases are indentures which cover the tenancy of Crown Lands and an attached schedule showing the area and location of the lease. Series notes: These permits are indentures which cover the tenancy of Crown Lands and an attached schedule showing the area and location of the permit. Series notes: This document is a list of holders of pastoral permits. The document is divided into columns for Permit number and holder. Permits listed start from 123 and end at 160. Series notes: Each page in the Volume is divided into columns for No. of Licence; No. of Application; Name and Address; Situation; Area; Amount Paid; Date Paid; Paid to; Remarks. Licence Nos. in volume 7-630. There is one per page up to 399 and several per page there after. Several entries made c.1929 state that all further entries to be made on cards. Series notes: The index which is at the front of the volume has entries for A-W. The back part of the volume has numbered pages 1-252 but has been used only to page 74. Each page is divided into columns for No. of Application; Date; Name and Address; Situation; Area; Amount Deposited with Application; Remarks. Series notes: This volume is an instruction book to colour leases. Each page is divided into columns for No. of application or lease; situation; lessee; No. of lease; remarks. Series notes: The volume contains an index to stations at the front of the book followed by the Register of Improvements which is contained on numbered pages 1-200;only the first 18 pages are used. Each page is divided into columns for Name of Property, Date inspected, Lease or Licence No., Area in sq. miles, Homestead Value, Buildings (No., Value), Yards (No., Value), Bores (No., Value), Tanks (No., Value), Wells (No., Value), Fencing (Internal - Miles, Value; Boundary - Miles, Value), Total Value and Remarks. There is no apparent order to entries as they are neither chronological (by date of inspection) nor alphabetical (by name of station). The personal records are listed according to the surname of the person who created or deposited the records with the NT Archives. The series listed in this category are mostly personal papers and photographs. The oral history records are listed against the name of the person who has been interviewed. The interviews are in the format of tapes, cd and transcripts. NTRS 234 Photographic copyprints of Koolpinyah Station n.d. The records series within this category are listed under the name of the organisation which created or collected the records. Non-government organisations are categorised as non-personal and non-government. Series entries include the control number (F or NTRS), the series title, the date range of records in the series.